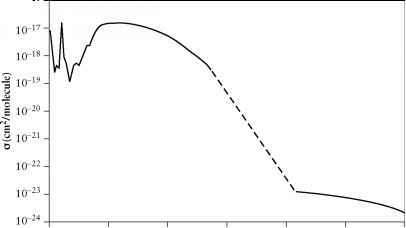 FIGURE 5-1 Potential energy curves for molecular oxygen. X = 3E—, a = JAg, b = A = 3E+,B = 3E— . 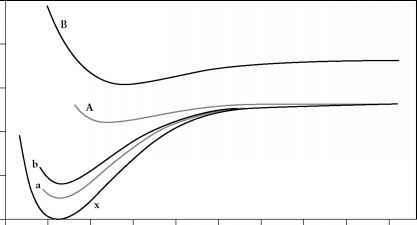 Drawn from data of F. R. Gilmore, J. Quant. Spectroscopy Radiat. Transfer, 5, 369-390 (1965). FIGURE 5-2 Absorption spectrum of molecular oxygen (note logarithmic vertical axis). The dotted line is the Schumann-Runge banded region. Drawn from data of M. Ackerman, in Meso-spheric Models and Related Experiments, G. Fiocco, ed., D. Reidel, Dordrecht, 1971, pp. 149-159. The very weak absorption shown in this case is a good example of the consequence of selection rule violation, the specific one in this case being that excitation from a negative (superscript —) to a positive (superscript +) state is a forbidden transition. The other selection rules given in Section 5.1 for diatomic molecules are obeyed, however. The difference between the bond dissociation energy of 02 into two ground-state oxygen atoms (492kJ/mol) and the start of the Schumann-Runge continuum (175 nm, corresponding to a photon energy of 682 kJ/einstein) is 190kJ/mol, which is the energy needed to excite an oxygen atom from its ground (3P2) state to the excited (*D2) state. This is a large excitation energy, making the *D2 atom a very reactive and important species in stratospheric and tropospheric photochemistry. with (5-17) found to be the favored reaction. turn out to be two of the most intense bands in the atmospheric airglow and in auroral displays.5 The 1Sg state also relaxes to the 1 Ag state by collisional deactivation. 4If deactivation occurred at every collision, the quenching rates would be approximately 4 x 105 and 108 times faster, respectively. See Section 4.3. 5Airglow is the faint glow of the sky produced by solar photochemical processes; it occurs at all latitudes. The aurora is produced by impact of high-energy solar particles; it is more intense than the airglow, but it is irregular and occurs near the poles. 6The reason for the negative activation energy is that oxygen atoms form an unstable intermediate complex with M, 0'M, which then reacts with another 0 atom to produce 02. As the temperature is raised, 0'M becomes more unstable so that its concentration is decreased, thereby decreasing the rate at which 0.M reacts with 0, hence decreasing the overall rate of 02 formation represented by reaction (5-21). Since reaction (5-21) is now kinetically complex, as pointed out in Section 4.3.1, the interpretation of the experimental activation energy as the height of a potential energy barrier is not valid. Assuming equilibrium between 0, M, and 0.M leads, however, to the same rate law as that for the trimolecular reaction (5-22). At extremely high pressures, well beyond those in any part of the atmosphere, the order of the reaction would decrease from third order to second order. However, these reactions are also governed by spin conservation and atomic radiative selection rules, and they also are negligible in comparison to 02 photodissociation. An important aspect of this energy transfer or sensitization is that spin is conserved. That is, the oxygen atom undergoes a singlet-triplet transition while the reverse triplet-singlet reaction occurs with molecular oxygen, so that total reactant and product spins are the same. 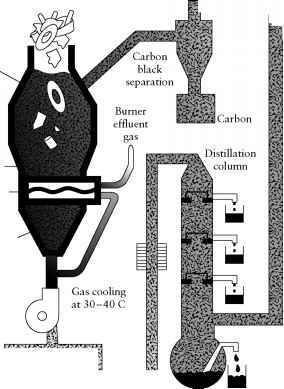 This is a very efficient process under exothermic conditions, probably occurring within an order of magnitude of collisional frequency, and therefore reaction (5-28) is one of the major sources of "singlet oxygen" O2(! Ag) in the atmosphere.